My mother and I are alone on a boat. Quite a luxury white sailing yacht, all white decks. My mother asks me to take the mainsail down, which means I have to go to the base of the mast where the halyard is fixed. She turns the boat into the wind so that the power is taken out of the mainsail. This is normal when you are taking down a sail. Both the headsail and the mainsail are flapping. 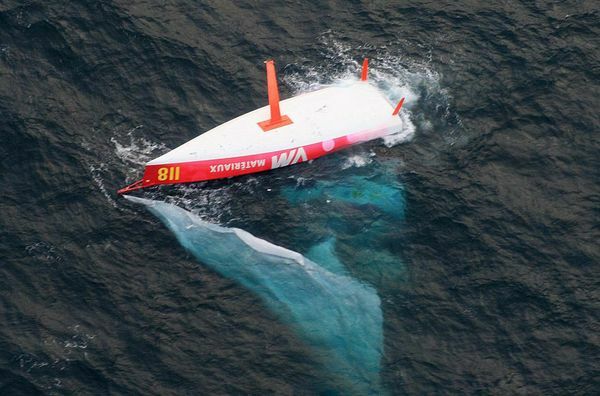 Suddenly the boat gibes, the mainsail swings over, and, at the same time, our boat hits a moored yacht in front of it and begins to capsize. The boom catches in the water, and I fall off under the sail. I feel all the sheets tangling about my legs, and the white sail above my head shutting out the sun. I know I will never get out and am going to drown and that there is no point fighting. Everything goes very quiet and very white and muffled as if I am dead to the world and wrapped in cottonwool. I wake up. D and I are larking about in his beloved Subaru to which, bizarrely, he has added a huge convertible roof. The inside of the car has been replaced with a large bed (or bath … cannot remember which), but the car looks fabulous and we are having fun. A huge overweight clergyman comes up to us. He is wearing a dog collar and tells us that he has a large river boat that he is taking for trips. Next thing I know, I am no longer in the Subaru, but instead inside this flat bottomed pleasure boat with a glass roof, and my mother is, again, at the helm. We are going very fast, skidding over the waves. My mother tells me (us?) that there are two ways to turn this boat round. I start to feel very scared, but she throws the boat into a 360′ turn at speed. We are all thrown about as the boat heels over, but, incredibly, we seem to have survived. I wake up.